Hello guys I need advice. I've struggled with acne a couple of years now and it does seem to get worse. My genetics have apparently blessed me with large pores and bad skin in general (see attachments). I've tried the regimen but it didn't help. It made my skin more oily and the pores more visible. Pore strips have a rather negative reputation since many people say that they only make the pores larger, something which I absolutely don't want to happen. Can you give me advice on products and things I can do to reduce the acne/pore size ? Have you tried dessert essence's thoroughly clean face wash? It is nice because it is all natural with tea tree oil but it disolves acne really well. If it is too strong you can dilute it with water. I think it works better than stuff with chemicals. There is not a lot you can do about genetically large pores though. Your best bet is rinsing it off with cold water once you are finishing washing your face. I would stay away from pore strips or any kind of extraction or you will end up with scarred pores. If pores are your main issue then i would suggest talking to your derm about retin A. It clears out pores, smooths out skin and should help with active acne. I would definitely NOT recommend accutane. Hey, how old are you? I just ask because it might just be a case of hormones, your skin looks great actually, your pores don't seem large maybe just a little blocked, but most people have this if you look up close, a mild salicylic acid cleanser or serum might help, but other than that, if you are in your teenage years I would just leave well alone, sometimes using harsh products can just make your skin more inflamed. Thank you all for your suggestions! I will definitely have a deeper look at the different products. @gkitten25 I am 19, Ye... they tend to be blocked. 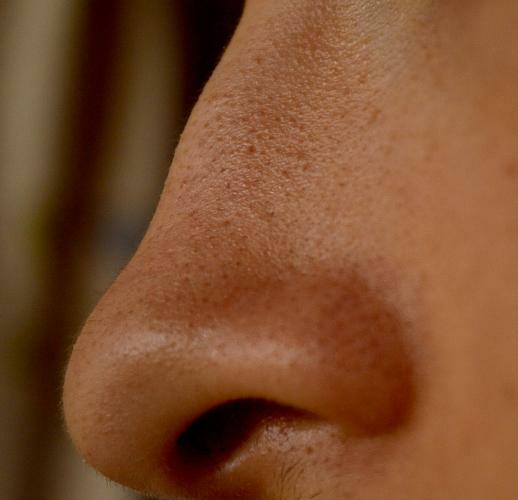 That combined with oily skin on the nose makes it more visible.